as for the charging times, assumingly all EV owners are smart, so will be charging at non-peak hours at night (from 11pm to 7pm) and/or during the day if they have solar panels and the sun is shining. With a solar + battery, timing wouldn’t matter. Just plugging in after returning home from work at 6pm is obviously not a good idea, as it would strain the supply system – and that would worry the line companies. 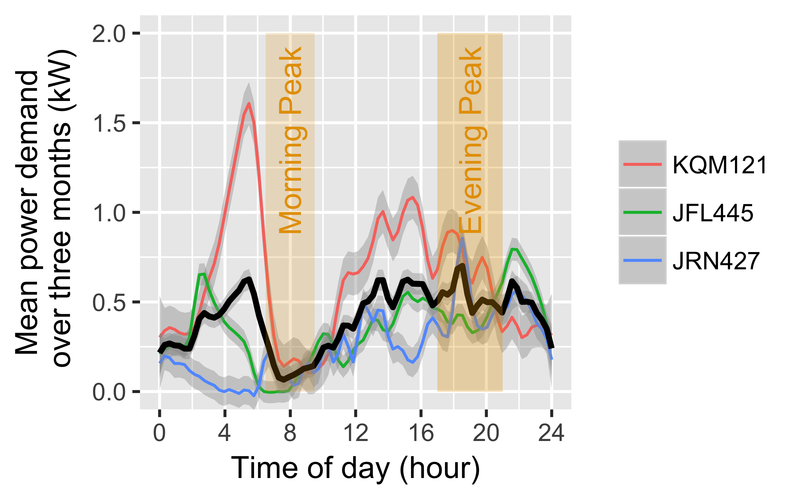 A bigger worry would be if lots start charging at the same time eg 11pm (or even worse 9pm). Using the End Charge timer is a relatively appealing alternative. For my car (KQM121) you can see the effect of the 7am end timer. However, also often have to top up during the day and those fast charges during long trips mean that there is still reasonable demand outside those early morning hours. Dima and others, with respect the current charging patterns are irrelevant. The reason for this is that when we have time of day billing, people will completely change their charging timing. Most people will organise the time of day they charge their car to match the low price points which will of course be outside the peak times. If lots start charging at the time of the drop in price, that will be worse for the electricity supply. Responding directly to time of day takes away all the present diversity. If there is interest in a cheap well made charge controller ( I don’t like the name “charger” because it isn’t , the charger is in the car ), I give a link to a website in the US that has information on a 40Amp kitset charge controller that is smart ,well engineered and can be assembled with some basic electrical knowledge. It is a complete kit but needs a 32A 6mm diameter TPS installed ,same size as you would use on an electric stove. I know that some of the drivers of electric vehicles are in the trade them selfs or if not ask help from your local electrician <or me for that matter. The website is : openevse.com. You can bring this 40A kitset charger in to NZ complete with a 7.5 meter cable with type1 connector (maybe also type2) for around $500 NZ. I can also help anybody with reliable websites in China which sell connectors ,or adaptors for type 2 to type 1 , type3 cables etc. for a reasonable price. Contact Our electricity supplier has a special night rate from 11 to 0600. It required the installation of a second metre at $125. That is the only time we charge and at home. Cost for our 2 Leafs 60 per month so far. We do not use extraneous charging though if we went on a longer trip we would have to. Many Leaf owners (and Kiwi dealers buying in Japan) chose their new EV based strongly on Battery SOH. Knowing this, would a series of Fast Charges before going up for sale artificially inflate the SOH we use as the basis for making our decision? Yes, a series of fast charges before sale would artificially inflate SoH. Hence care is required when basing a purchase solely on a SoH value. It is also possible, although rare, to reset the battery management system (BMS) so SoH returns to 100% and the battery capacity bars return to 12. The BMS then ‘learns’ the real SoH and capacity bars as the battery is cycled. In these cases you generally see a much larger and faster drop in SoH than what you see following a series of fast charges. This mirrors what happened with my 2014 Leaf, bought in November 2017. At the time of purchase, it had a SoH of 98%. This dropped in a startling way to about 93% over the next six months during which time I was doing slow charges only. Subsequently, I have been doing a mixture of slow and fast charges and it has stabilised at about 92.5% and has maintained that level since (about the last 4 months). 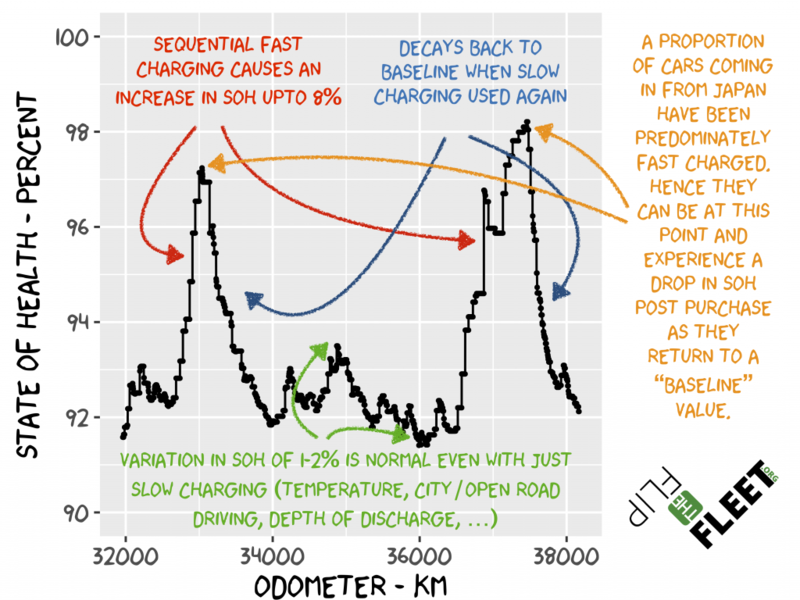 Every fast charge results in a small increase in SoH, every slow charge a small decrease. All this makes one doubt how reliable the SoH actually is as a measure of battery condition. If I had used fast charges from the start of ownership, then a simple extrapolation suggests that if the SoH was 98% after three years of battery life, it would still be 90% after 15 years, which would be really good, verging on the miraculous, and completely unbelievable. It would be really nice to know exactly how Nissan measure SoH, maybe its a charge in – charge out difference, or maybe they just use the internal battery resistance. On a completely separate matter, I just re-insured the Leaf and found that AMI wanted $140 more this year to insure it. When I rang them, a variety of unconvincing reasons were given, but included was that they have found that electric vehicles cost more to repair. I wonder if the lack of service back-up/parts from Nissan NZ for used Leafs has anything to do with this. When improved clean air regulations were introduced in Christchurch, fireplaces and old wood burners were replaced by heat pumps. The rhetoric of the time was very similar to the conversation today about EV charging. The nay sayers assured us that the extra demand was beyond the capability of the distribution network. It is just as unlikely that EVs will “strain” the distribution system, and the myth that they might is an argument used by people with a vested interest in the status quo. An EV owner who travels 40 km per day is trying to get an extra 5 or 6 kWh out of the distribution system. This can be done overnight with only a small increase in demand. Anyone with a couple of heat pumps will be able to charge a car so long as the heat pumps are not running, many will be able to charge the car and run the heat pump at the same time. Domestic peak demands are so much higher than the average demand that with a very small amount of management energy consumption can be increased substantially without much increase in the peak demand. Of much more concern than the system demand should be the actions of energy companies who use this mythical issue to promote EV tariffs that actually disadvantage EV owners.